In a small midwestern town, named for its tall redwood trees and twin cascading waterfalls, a young woman falls in love and discovers the power of expressing the poetic voice within her. As I carefully walked down the narrow, winding trail to my destination, I could hear the rumble of the twin waterfalls several hundred feet away getting louder as I made my way towards the bridge. Knowing my own tender heart and how anxious I would be, I arrived at our meeting place early. The waterfalls weren’t the only thing rumbling that late August day. My heart pounded loudly inside my chest as my anticipation about our rendezvous grew. As my flip-flops crunched on the loose gravel, I switched the frame over to my left hand so that I could more easily maneuver the final step. I was grateful then for the extra time to collect my thoughts. I walked mindfully to the middle of the small rounded bridge and propped the frame up against the weathered brown wood. I smiled as I remembered another secret rendezvous years before when I alone had carved our initials on the backside of the bridge. Back then and in my imagination, I had foreseen a new friendship forming that would slowly turn into something more. Were we at that point? Were we ready to take that next step? I was about to find out. As I glanced down at what I had created for you, the screen of my mind played a wonderful movie about the year that had recently passed. Me away at college. You escorting me to my military formals. Summers back home working at the store. You working and studying and working more to make extra cash. Letters and cards. Long distance phone calls. Slow walks, water fights, and practical jokes. Car karaoke and mixed tapes with all the classic 60’s and 70’s tunes (with you singing Gladys Knight while I did my best to perform the part of the Pips). Motorcycle rides and funny notes left on car windshields. The poem I had written for you started out as pencil scribbles on loose leaf paper. If you only knew, it began. What then? More words spilled forth and kept coming until the poem nearly wrote itself. So pure and noble were the intentions; the feelings so soft and vulnerable. Then the words took their final intended shape as they flowed from my black fountain pen onto fancy parchment paper. That same paper was dusted with blue chalky clouds and then lovingly placed in a black metal frame with a cream colored border. If you only knew, the poem continued. Ripe with so much possibility. A possibility I could feel as I stood waiting on that bridge for you. I was so lost in my dreams of us that I barely noticed the sound of crunching gravel as you approached. Then came the sight of your tall, lean frame as you made your way down the curved path and joined me on the bridge. I immediately relaxed when you grinned at me with your devilishly handsome smile, the way you always did. We quickly fell into our easy, familiar rhythm as the sound of the waterfalls faded into the background. We sat together on that waterfall bridge, looking into each other’s eyes, seemingly for the first time though to me it felt like I had been looking into those depths for centuries. I told you the story of the poem. How it had come to pass and what you had come to mean to me. You listened with compassion and a mature understanding as my hopes and dreams for us spilled from my heart and lips for the first time. You looked at me then and spoke with a lightness and love in your eyes; a promise of more memories to be made. We crossed a bridge that day. A crossing that would forever alter our direction and the choices we would make from that day forward. 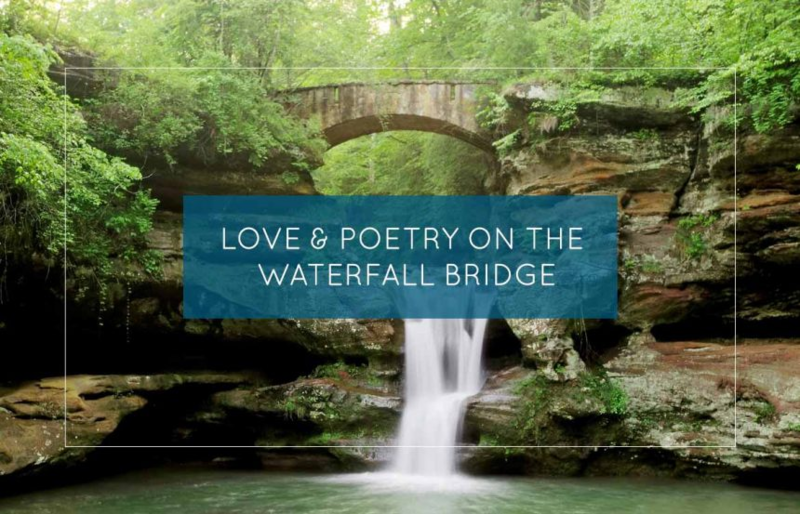 The realization that we each have our own poetic voice would come to me decades after the waterfall bridge, though looking back on that time now I am certain of one thing. The young experience of writing and expressing myself using my poetic voice opened up a new doorway for me that I gladly stepped through. To this day that experience continues to have a profound and emotional impact on me. Something powerful and life-changing wanted to be expressed and shared through me and this was the channel that was chosen. Why do you suppose that is? I believe that our poetic voice is a beautiful divine gift. A gift that each of us has been given and is meant to share, but perhaps one that most of us haven’t gotten around to unwrapping just yet. Perhaps we’re just not sure how to discover ours. Where do you even start? I’ve discovered a surefire way to tease out the poetic voice in anyone. Even those who automatically respond by telling me they don’t have a ‘poetic bone in their body’. With a quick and understanding smile, I agree with their assessment about the non-existence of a ‘special poetic bone’ and assure them it’s actually a ‘poetic voice’ we can look for. This voice can be heard and it can be felt. And it will reveal itself to us in the most unexpected and delightful ways when we allow it. My poetic voice was reawakened in me after making a commitment to participate in a simple 30-day poetry challenge. What transpired as a result of that decision would again change the trajectory of my life just as it did that day on the waterfall bridge. I continue to practice the challenge multiple times each year because each time I do, something new and beautiful blooms inside of the space created by the poems. Are you ready to meet your inner poet? Michele Marie Neyers is an international bestselling author, poet, educator, and passionate creator of all things beautiful and useful. She believes that everyone has a poetic voice within and offers her readers a simple challenge for teasing out their own poetic voice. Her first published book – 3 Lines 30 Days | Unleash Your Inner Poet – is a collection of original poetry with a creative twist. The book was released on July 31st, 2018 and is currently available at www.3lines30days.com. Michele (along with her cat, Sophie) lives, works, kayaks, and writes near Annapolis, Maryland in a dream house she designed and built with breathtaking views of the water. Connect with her at www.facebook.com/AuthorMicheleMNeyers and write to her at michele@micheleneyers.com. Connect with other aspiring poets and participate in the next 30-day poetry challenge by visiting www.facebook.com/groups/3lines30days.